Consumer data is the driving force behind any successful marketing campaign, enabling you to maximise the ROI on channels like programmatic, social and TV. Despite audience data in paid search being a fairly new phenomenon, it’s becoming increasingly important when it comes to planning PPC campaigns. So how can you harness audience data to target your campaigns and drive conversions? Let’s start by looking at the differences between organic and paid search (or pay-per-click (PPC)) marketing. While the former requires no upfront costs, other than staff time and expertise, it normally takes several months to start seeing improvements on a site’s ranking, particularly in competitive industries like insurance. Paid search, on the other hand, offers more immediate results. Although with some popular key words costing over £50 per click, you’ll need to bid on the right ones to ensure a strong return. Location targeting is also a factor that affects the performance of your PPC campaigns. Although you can manually adjust bid modifiers to reach a particular location, this can be time-consuming based on your campaign data alone. 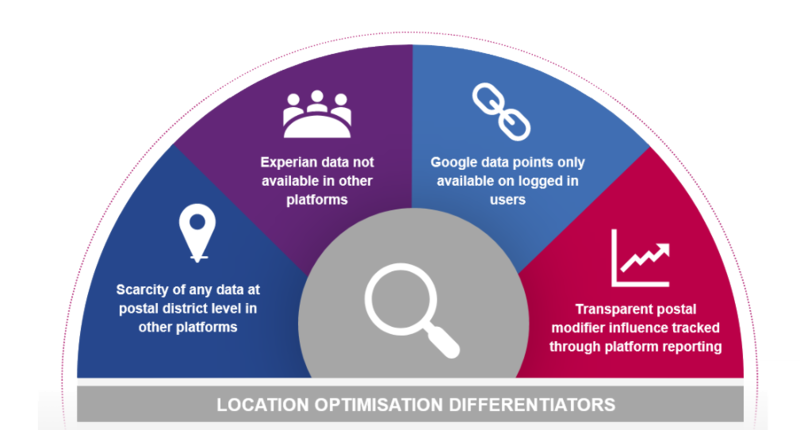 This is where the Experian and cClearly platform can help, as it automatically optimises your bidding strategies and keyword bidding at a postal-district level through the integration of Experian’s deep, rich data attributes. You are then able to reach the most relevant customers in different parts of the UK, according to their interests, life stage and demographics. This means your adverts rank higher in the paid search results and reaches the most relevant audiences in a more effective and efficient way. The platform works by aligning Experian data with historical data from your Google Ads account using machine learning algorithms. The platform takes the patterns and conversion history from your account and matches it against Experian data, before applying a bid modifier. If your search term is ‘performance car’, for instance, you can automatically target the most relevant, or best performing postal districts for that keyword. This approach has time-saving benefits for digital marketers, who can automate their bidding, rather than manually on a daily, weekly or monthly basis. By removing such processes, you have more time to analyse performance, develop your strategy and experiment with new ads that deliver better results. More effective targeting also means you stand a better chance of increasing conversion rates and improving ROI, since the platform’s modifying capability allows you to reach the people that matter most to your brand. The platform addresses another common challenge, namely, the scarcity of location optimisation data. With access to hundreds of data points, you’ll achieve greater granularity to improve conversions. Furthermore, you have complete transparency over the variables driving the most positive and negative correlations affecting the bid modifier – which can then be used to refine and detail targeting across other channels. All this requires no change to current campaign flow management, and there is certainly no need for additional training in the team, nor for them to manage another dashboard. The platform has been developed to integrate with existing workflow management tools, so there is no disruption.